Weaving its way from Park City to Echo Reservoir, this 28-mile, non-motorized trail provides a close-up view of area wildlife and wildflowers. Explore the trail on foot, mountain bike, skis, or horseback. Location: Park City to Echo, Rail-trail connects Park City and Jordanelle Reservoir north & east through Wanship and Coalville to Echo Reservoir. "The Rail Trail" as it is commonly known follows the historic route of the Union Pacific railroad spur from the mining town of Park City to the main Union Pacific Railroad line still in use at Echo. The entire trail is 28 miles long with four different access points along the route. The trail traverses areas rich in cultural history from the Wasatch Mountains near Park City, across wetland meadows in Silver Creek Canyon, through the rural towns of Wanship and Coalville, and along the scenic Weber River, to Echo Reservoir. The Rail Trail parallels 1-80 and often runs between the lanes. This meandering trail is ideal for beginners and families along any segment of the route or more advanced bikers looking for a long-distance ride. 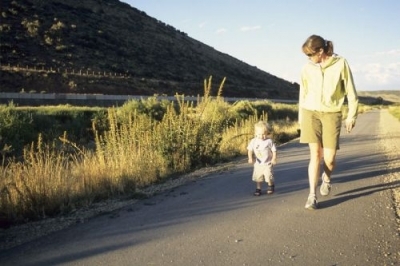 The Rail Trail is a strong spine with connections to the sprawling 335 miles of trail in Park City. The latest connection is the acquisition of the Phoston Spur which will directly link the Rail Trail with the towns of Heber and Midway and eventually link the entire Wasatch Back, from Provo to Park City. Perhaps one of the most unique aspects is the partnership between Utah State Parks and Mountain Trails Foundation of Park City which manages the trail under contract. This successful partnership has resulted in a well-managed, well-maintained trail for many years. The Rail Trail provides exceptional recreational opportunities but also provides transportation for the Hispanic community that uses the trail as a route to the resorts, restaurants, ski areas and public transportation. It is not unusual to encounter the broad population that uses the trail from joggers, dog walkers, kids walking to school, mountain bikers, geocachers, endurance athletes and birdwatchers on the" in town "section of the trail. There are quirky sculptures provided by Park City's "phantom sculptor" which pop up in unusual places and brings a smile to the face of the unsuspecting trail users. The Rail Trail also connects with the brand new Quinn's Recreation Fields and Ice Rink which will open winter 2006 and will surely be the route used by youngsters for safe access to the soccer and baseball fields. The Rail Trail is connects with National Ability Center. The Historic Union Pacific Rail Trail was designated as "One of America's first 500 Rail Trails by the Rails to Trails Conservancy in 1992. The fairly level topography often provides the first trail experience for many visitors and beginners in this high altitude mountain town. The Park City trailhead area has experienced an economic redevelopment lately with Rail Central which houses restaurants, a bike shop and office space. 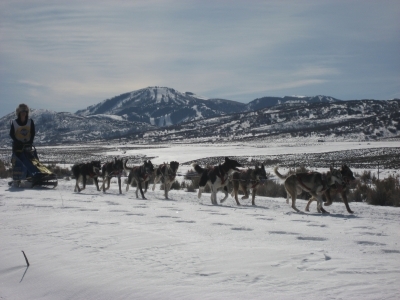 Dog sled on Historic Union Pacific Rail Trail near Park City, Utah. Photo by Bob Kollar.